We are extremely proud to announce that over £190 was raised at the Macmillan World's Biggest Coffee Morning last Friday! A huge thank you to all who came and supported the event. Thursday the 19th July 2018 saw Palladium Building Supplies annual Golf day held at Bigbury Golf Club. The event was well supported by customers and suppliers from the branches in Kingsbridge, Plymouth and Ivybridge. The day was started with a chipping competition, a child's paddling pool being used as a target, a good opportunity to warm up and get your distance. The claxon wend off at noon for a shotgun start with the Palladium refreshments buggies doing the rounds, thankfully the weather stayed with the golfers, with cloudless skies and a gentle breeze. The evening was concluded with Palladium group directors Keith and Gary Olver giving prizes for the day, and the charity action which raised £2238 for The Rainy Day Trust, The Devon Air Ambulance Trust and The Triangle Outreach Centre which is based at the South Hams Hospital in Kingsbridge. Thank you all to those who took part and contributed to the success of this annual event. Palladium Girls made it to the local Newspaper this week! On Saturday 21st July 2018 five girls form the Kingsbridge and Ivybridge Branches of Palladium Building Supplies, along with over 1,700 other ladies, took part in the Neon Midnight Walk in Plymouth. The girls managed to raise an amazing amount of money from sponsorship raised by our wonderful customers and suppliers. With money still coming through, the total at the moment is over £1,000 and will be used by St Luke's Hospice Plymouth, a charity providing specialist advice and support to people with progressive life-limiting illnesses in the South West area. Their evening began with an energetic warm up, the walk started at 10 pm. With aching legs and a few blisters they finished the 6 mile walk 2 hours later. On behalf of the 'Palladium Dumpies' we would like like to thank all those who supported them with their challenge and wish St Luke's Hospice Plymouth all the best in reaching their goals. Palladium Building Supplies is proud to support Armed Forces Day. On July 21st this year, our very own Liz Ridding, Karina Tyszkiewicz, Nicky Wilson, Jo Clark and Karen Borton will join thousands of other women and take part in the Neon Midnight Walk in Plymouth, raising money to help St Luke's Hospice Plymouth provide free specialist end of life care. Girls are hoping to raise £500 for this local, worthwile cause by walking 6 miles over the evening and early morning of the 21st and 22nd of July, so please give what you can because every pound will truly count towards the wonderful work St Luke's Hospice does. To donate and support Team Palladium please click picture below. We're looking forward to trying the home grown vegetables. 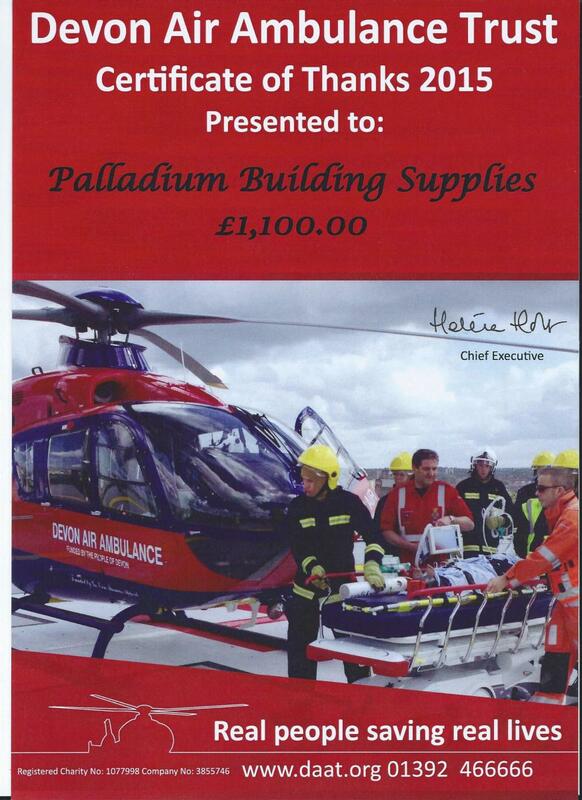 Palladium Building Supplies were proud to present The Devon Air Ambulance Trust and The Kingsbridge Triangle Trust with the proceeds of the auction from the 2017 Golf Day at Bigbury Golf Club, two charities we're proud to be associated with. Palladium Building Supplies are the proud sponsors of the tour for this seasons tour of France for the girls U15 Kingsbridge RFC. The team of 20, along with the coaching and managerial staff will be visiting Brittany in early April and playing two matches against teams from the surrounding regions of Finistere and Ille et Villain. We've taken the decision to close our Kingsbridge and Ivybridge branches at 1pm, allowing staff to get home before the worsening weather arrives. Apologies again for any inconvenience, we'll be open tomorrow (Saturday 3rd) normal business hours. Due to the safe and wellbeing of our team, we will not be opening Burrington Way Branch today (02/03).The Branch will re-open again tomorrow. Ivybridge, Kingsbridge and St Levn Road branch are open until further notice. We do apologise for any inconvenience caused. Due to the worsening weather we're closing our branches today (01/03/2018) at 2:30pm. We'll be there tomorrow, usual hours where we'll make an assessment on the weather then. The team of Dartmoor Search and Rescue Team - Plymouth offer an invaluable service to those who live in and around Dartmoor and those who use the moor recreationally, finding loved ones and saving lives in the communities of Plymouth, Dartmoor and the surrounding areas. 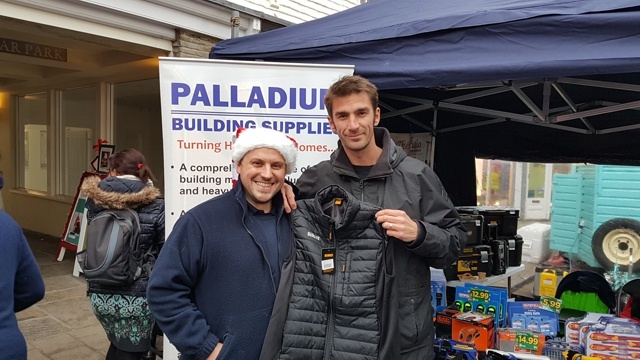 Palladium Building Supplies have a proud association with DSRTP and have given the team new fleeces and a wall mounted power washer, hopefully the fleeces will keep the team warm and the power washer will keep the rescue vehicles clean. Pictured: Keith Olver (Palladium Managing Director) with Vicky Coumbe (DSRTP Chairman) along with the Team Members. Vehicle available at our Kingsbridge Branch: FOR SALE: Leyland DAF/FALF45.180 10E. We've had this vehicle from new. Regular servicing at Nicholas Rowell Haulage, excellent working and running order. Full documenation available to view, 207,600km on the clock. Ready to drive away. £13.000 plus VAT. The latest additions to our Kingsbridge fleet. Our new DAF Trucks N.V. both custom built vehicles with laden weights of 12 and 18 tonnes, capable of delivering to the hardest to reach sites in and around the South Hams. 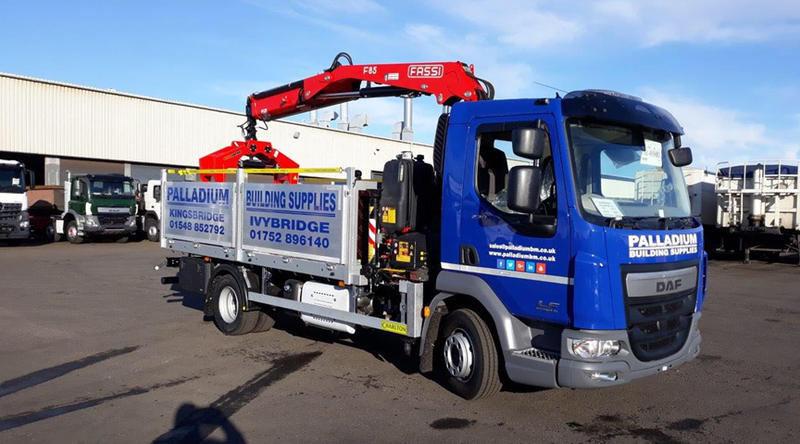 We pride ourselves on the quality of service we provide and this transcends to the quality our delivery fleet which need to be robust enough to cope with the demands of the building industry. Our vehicles were supplied by Tim Scott of Trans Lease Services, the bodywork was completed by Charlton Bodywork and the artwork and signwriting by Andy Grapihx Ltd. They'll be in operation on Janurary 2nd 2018 and will allow us to extend and improve our service to our customers. Saturday 2nd December 2017 saw the town come together for the Kingsbridge Celebrates Christmas Festival with stalls lining Fore Street. Stallholders from across Devon came to sell hot food and gifts, as well as a visit from Father Christmas and live entertainment there really was no better place to celebrate Kingsbridge and get into the Christmas spirit. 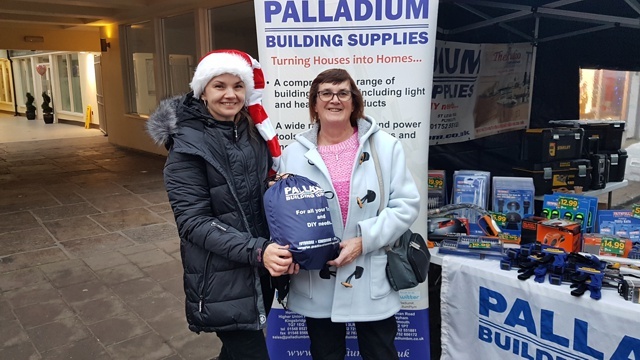 The Palladium Building Supplies stall had spot prize draws throughout the day, Sylvain and Karina did a wonderful job with our stall and also entered into the spirit of the season and the day. Congratulations to all our lucky winners who entered our free prize draw. We are proud to announce that on Friday 17th November our Burrington Way and St Levan Road Branches in Plymouth raised £100 in aid of Children in Need. Thank you to everyone who helped us make the day a success. Congratulation to Clint Reily for winning the World's Tallest Cake Tower. A massive thank you to everyone who came and donated to our Macmillan Coffee Morning. Our St Levan branch managed to raise over £70 for a very worthy cause. Pavestone Dover to Monte Carlo Rally 2017. Thank you all so very much for supporting us, sponsoring us and sendign us on our way with luck and your best wishes. As a team we managed to raise over £4,800 excl. gift aid through our branches in Kingsbirdge, Ivybrigde and Plymouth for The Rainy Day Trust and The Teenage Cancer Trust. We drove through a 7km tunne in Austria, realised the Swiss have 4G Internet access and radio reception in their tunnels, we stood at dawn in the cold mountain air in Liechenstein, and saw the vibrancy of Luxembourg City. We drove as a team, at times in tired silence, other times sining at the tops of our voices, in fancy dress, always keeping a sense of homour and perspective. We laughed at conversations and situations, when the taxi diver in Luxembourg asked Sylvain where in England he learnt French? - "Eh, I'm from Bordeaux", Keith "lead foot" Olver reversing into the same barrier twice, Nicky taking poor old Evie to 92mph (speed record), and me taking the racing line on any road I drove, deciding to run 400 meters after sitting in a car for 10 hours, dumping the bicycles in Verona and driving into Casino Square in Monaco, wine tasting at the Chateau and spending the day at a medieval walled village. But for us the hospitality from a French family, who welcomed us into their home and offered us sanctury for the night, allowed us to relax, fed and watered us then sent us safely on our way the next morning is the thing that will stay with us. So to the family Bordas for looking after us and showing us some French culture, merci! The team and vehicle carrying the hopes of Devon in this years' Pavestone Rally 2017 Dover to Monte Carlo. Evie (the Volvo) has been given a thorough once over, had a shake down, it's installation lap and passed with flying colours, but can't say the same for the team. Keith, Nick, Nicky and Sylvain are looking forward the challenge and still raising as much money as possible for The Teenage Cancer Trust and The Rainy Day Trust. Please give as much as you can on our Virgin Money Giving page. Europe look out, we're on our way!!! Customers from across the Palladium Building Supplies group took advantage of the fine summer weather to participate in this years Golf Day. Whilst the theme of the day is to enjoy the golf the competition amongst the players was fierce with rivalries renewed from years gone by. Into the evening we had our charity auction and due to the genorosity of our customers and suppliers we managed to raise £3000 which will be split between our chosen charities, The Devon Air Ambulance Trust, The Rainy Day Trust, The Teenage Cancer Trust and The Triangle Outreach Centre which is based at the South Hams Hospital in Kingsbridge and offers support to cancer suffers and their families. Whilst Palladium has a long association with The Devon Air Amulance and The Triangle Outreach Centre, The Rainy Day and The Teenage Cancer Trusts are being support this year in support of The Pavestone Rally 2017 Dover to Monte Carlo which Palladium Building Supplies (Kingsbridge) Ltd are participating in. In September Keith, Nick, Nicky and Sylvain will, along wiht 40 other teams, drive across Europe, 10 countries in 4 days, raising as much money as possible for these two worthwhile charities. If you'd like to support the team you can sponsor them in any branch of Palladium Building Supplies or by following the link to their fundraising page. Kingsbridge Branch now stock a complete range of TIMco screws, fixings, fastners and nails. TIMco are a leading supplier of screws and fixings and we're proud to be associated with them. Special mention to John and Josh who spent two days merchandising our Kingsbridge branch. Thank you both for doing a wonderful job. Palladium Building Supplies are proud to sponsor and be associated with The Railway Beacon's under 15's boys Football Team. The Railway Beacon's have won promotion to the next tier by winning The Royal Oak DJM League with an emphatic win over their title rivals Ivybridge on the last day of the season. The boys have been playing together for 4 years, first in the under 11's then progressing through to the under 15's. No team is complete without the manager, coach, trainers and willing family who ferry their charges from match to match so a special thank you to all those involved. Congratulations lads, an outstanding season, worthy winners. Many congratulations to our managing director Keith Olver who's been accepted as a Liveryman to the Worshipful Company fo Builders Merchants. Keith was accepted into the Livery in a ceremony hosted by the Master in London, membership being by invitation only something not bestowed on many. The Worshipful Company of Builders Merchants plays a key part in teh builders' merchants and fundraising for a number of charities. It is also very active in supporting the Mayoralty in the city of London and raising the profile of builders' merchants, while highlighting their importance in 'Supplying Britain's Building Needs'. 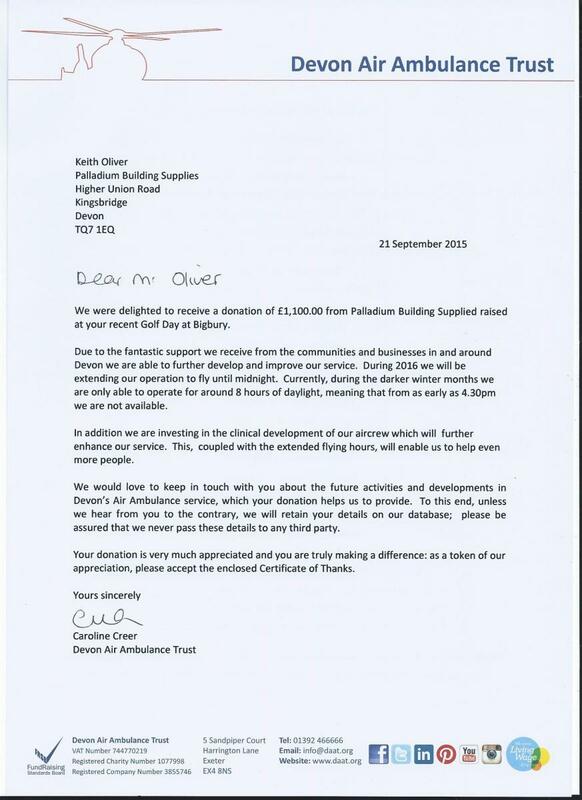 Over the past 25 years, Palladium Building Supplies have been proud to be associated with the Devon Air Ambulance Trust. Though found raising events, and thanks to the gnenrosity of Palladium's customers and suppliers, our branches in Ivybridge, Kingsbridge and Plymouth have been able to raise funds for this important charity. Since their first flown mission, the Trust has been serving communities in Devon and saving many lives. The skill of all those involved in the Trust is only matched by their dedication in serving Devon. We're sorry to announce that our Brian is leaving Palladium in Kingsbridge. Over the years Brian has been studiously working away in the top office, contributing to the smooth running of the company. Personally you couldn't meet a nicer person, who's honest, compassionate and a caring soul who has with his manner managed to calm those around him when it all semms to be getting away from you. Brian will be sorely missed, all the very best mate, enjoy your retirement and when you're eating that sticky bun by the sea think of us!!! We are in the midst of organising a Trade Day for Wednesday May 17th 2017 8am - 4pm. We have over 20 suppliers who will be in attendance. Everyone who attends will receive a voucher for a free pasty and coffee. The suppliers will also have promotional freebies, raffle prizes, excellent deals to be had at very silly prices, but it is for one day only! Make a Diary date - don't miss the one oportunity to pick up a cracking deal! Wednesday May 17th at Burrington Way Branch. Here she is!!! This is the vehicle that's going to take us around Europe on the 2017 Dover to Monte Carlo Pavestone Rally. We've still got a few months to get her ready, our plan is in place so stay close for all our up to date news. 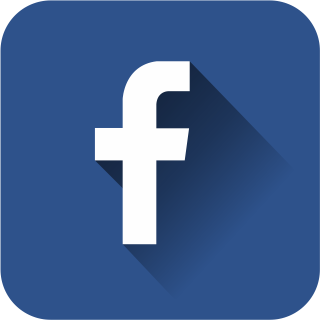 Please follow the links to our Just Giving pages and help us to support the Teenage Cancer Trust and Rainy Day Trust by giving what you can to these charities - thank you. Colour inspiration can be found just above anywhere; from a cushion or pair of shoes, to the flowers in your garden. Thanks to the Dulux Vusalizer App it's now easier than ever before to bring those colours to life in your home. The eas to use app lets you pick a colour from anywhere, and with augmented reality technology, allows you to see the colours live in your living space. And that's not all. Find out just how simple Dulux Visualizer App is to use. A successful morning with interest from several contractors at our Kingsbridge Branch. Crystal Glass offer a no nonsense easy approach to quoting for doors and windows. Choices of style and colour, fully finished for site delivery, a convenient service that has the contractor in mind. A company that can fit into your schedule Crystal Glass along with Palladium Building Supplies offer the comoplete service, from inception to delivery. Our Plymouth branch was pleased to supply The Wolseley Trust with paint and materials to enable the charity to build a sleigh for Santa so he could give out presents to the children at the Trusts Family Festive Fayre. 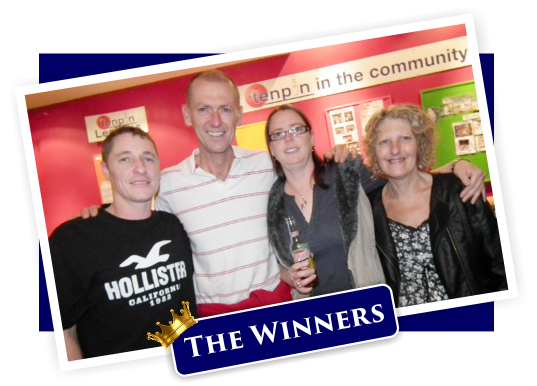 Congratulations to all the winners of our Free Prize Draws over the festive period. All our winners did was complete a simple form to win these fantastic prizes so it's worht keeping up to date on all our news, competitions and events! We are very proud to be associated with Kingsbridge in Bloom and look forward to many more successful years helping such a worthy project. Congratulations to David, Graham and the team on their fantastic efforts in helping raise the profile of our town and the South Hams and making Kingsbridge look absolutely wonderful. 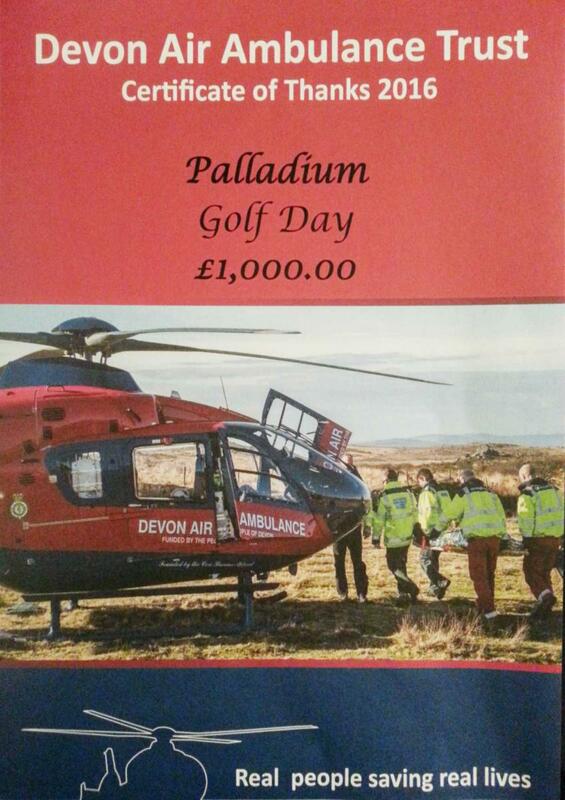 We are proud to announce that Palladium Golf Day raised £1.000 each for the Devon Air Ambulance Trust, The Triangle Centre in Kingsbridge and Bigbury Golf Club's development fund. On Thursday 30th June we went to Kingsbridge Community College to present the prizes for the Kitchen Design Competition. We are always excited to see the designs when they are completed and as with previous years the judging proved difficult as the designs were well executed and the models completed with a lot of attention to detail, including working lights in several of the models. The public vote got off to a slow start with many people casting their votes within the last couple of weeks. For the fourth year running The Studio @ Palladium in conjunction with Kingsbridge Community College are running a competition to find the best technical and practical kitchen design. The students were tasked with producing a mood board and 3D model, with prizes being awarded by the Studio Team for 1st, nd and 3rd place. A prize will also be awarded for the design with the most Public Votes, voting is open to everyone. All the designs are on display in the Showrrom of The Studio in Higher Union Road, Kingsbridge where you can vote in person. Alternatively you will be able to view them through our websites www.thestudioatpalladium.co.uk or www.palladiumbm.co.uk or via Facebook where you can "like" you favourite design. You can also cast your vote by emailing the Studio directly on studio@palladiumbm.co.uk. Remember the design with the most votes wins the Public Votes so get voting for your favourite. The standard is high and to fully appreciate the designs they need to be seen. Judging as always will be difficult. We look forward to welcoming you to our Showroom! Abiee Olver Skydives 14.000 feet over the Great Barrier Reef and fly's the flag for Palladium! Now we have available the Dulux Trade Colour Palette mixing facility in Ivybridge and Kingsbridge stores. This amazing piece of technology from Dulux UK gives us over 10.000 options on colour mix, whateverthe colour, whatever the finish. We can offer 250ml sampler cans so you can get the colour absolutely right. We also stock the Armstead Paint Range which gives Dulux quality and reliability at everyday prices. Come into our branches and talk to one of our decorating specialist, give us 10 minutes and we can help you transform your home. Our world famous Beanie Hat Competition, now it's 5th Year. The funniest, wackiest or weirdest will win the prize. Prizes for the best two - Good Luck! 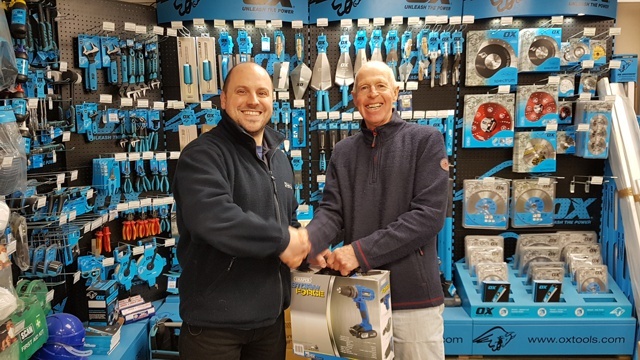 Our Christmas Draw lucky winner collecting his prize from our shop supervisor Sylvain. Congratulations Alex! Congratulations to Dexter Janes for winning our Kingsbridge Celebrates Christmas Free Prize Draw! On Saturday the 5th of December the town came together for the Kingsbridge Celebrates Christmas Extravaganza. Fore Street was closed to traffic which allowed traders to show their products and offer their services to the general public. The day saw Darth Vader, Stormtroopers, Mini Mouse and Olaf on hand for photographs, along with lots to do, see, eat and drink. Palladium's own Karina, Sylvain & Emma spent the day on the Palladium stall offering "One the Day" deals and advice to customers and everyone who attended our stall and attended and supported the event, thank you. Last Saturday night some of the staff at the Kingsbridge and Ivybridge branch enjoyed an evening out at La Ranchera in Kingsbridge having authentic Mexican food in a delightful and relaxed atmosphere. Thank you to all the staff at La Ranchera in Kingsbridge for a wonderful evening. Karina, Emma, Karen & Steve who recently attended two days of product training and a tour of the processing factory at Hunter Plastics Limited in Kent. All four greatly appreciated the time and effort the staff and the training centre and factory gave them - thank you! 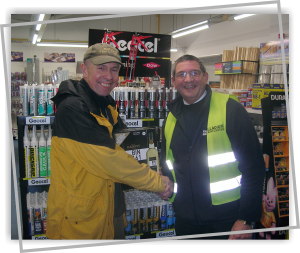 Saturday the 3rd of October 2015 saw the grand opening of the latest branch of Palladium Building Supplies. The South Devon based independent builders merchant had a Family Fun Day at their newest branch in Ivybridge, complete with a bouncy castle, face painting and donkey rides, thankfully the sun shone and a grand day was had by all. With food, refreshments and the staff getting into the spirit of the day, with special offers on the day, prize giveaways and competitions to keep everyone amused and interested. The branch was officially opened by Steve Lee, the branch General Manager, who along with the staff presented an enthusiastic welcome to all who attended and made the day what it was. A massive thank you to everyone who came, baked, bought and donated to our Macmillan Coffee Morning. Our Kingsbridge branch managed to raise a little over £140 and our Plymouth branch raised £200 for a very worthy cause. Every cup of coffee sold and every piece of cake eaten helps give someone facing cancer to support they need to feel more in control of their life, from the moment they are diagnosed, throught treatment and afterwards. PS. Special thanks to The Crab Shell Inn Kingsbridge for the loan of the coffee machine, Toolbank for donating raffle prizes and Drinkmaster for donating coffee. Congratulations to Mr Rees, the winner of our Kingsbridge Show Prize Draw! Thank you all who visited our stand at Kingsbridge Show on Saturday. Thankfully the weather held and hopefully everyone had a good time, the Palladium team attending our stand defnitely did. Thank you all so very much for making the day what it is. (Kingsbridge Show Prize Draw winner will be announecd shortly). Roll the Dice, the racehorse part owned by Palladium Building Supplies in Devon has been recently sold to a good home in Yorkshire where he will enjoy Point to Point racing and live in semi-retirement. Roll the Dice had a very successful career in flat racing wining prize money in 26 of 32 races he entered. We hope he enjoys his retirement! Palladium have renewed their sponsorship of another race horse call Roll the Dough (similar name purelu coincidenta). Roll the Dough is six years old and has shown good form in training this season and is scheduled to have his first race in October, hopefully he'll be as successful as Roll the Dice. The annual Palladium Charity Golf Day took place at Bigbury Golf Club on the 23rd July 2015. A total of 80 golfers, customers from Kingsbridge and Plymouth took part along with suppliers in almost perfect weather. During registration bacon baps and coffee was served, and the day started with the club professional organising a putting competition which tested control and accuracy. All the teams of four golfers were at their starting pins ready for a 1pm start with several in play competitions wich included: closes ball to the pin, the longest and straightest drive, most tries to get out of a sand bunker and strangest shot. The day continued with a charity action with pirzes generously donated by our suppliers which included golf days at Bristol and Kendalshire, a box at Old Trafford to watch a Manchaster United home game, a malt whiskey hamper, wide screen television and many many more prizes. The charity auction raised over £3,200 for the Devon Air Ambulance and a golf charity supported by Bigbury Golf Club. Palladium Building Supplies would like to wish Chris a Happy Birthday! Today we visited Kingsbridge Community College to present the prizes for our annual Kitchen Design Competition. We were very impressed with the overall quality of the entries we received, they have improved year on year with the students incorporating more into their desings and models. This made judging the designs more challenging for us! This year we awarded two commendations in addition to the other prizes, these students were Julia Farkas and Becky Allen who had both incorporated working lighting into their models. The public vote was very popular this year and many more votes were cast than in previous years. The results of the prize giving: Harriet Stumbles won the Public Vote with 291 votes. The 3rd place prize was awarded to Aimee Prescott. The 2nd place prize was awarded to Luisa Ellis. The 1st place prize was awarded to Haseebah Asharaf. We congratulated the students for their efforts and all those who took part were given a box of chocolates in recognition of the what they managed to acheive. The newest addition to our delivery fleet, the Isuzu Drop side, crane offload commercial vehicle. With a payload of 6 tonnes and a purpose built chassis to deal with the narrow Devon lane, this vehicle can deliver to the most remote sites and with a front mounted crane it can offload building materials on site with ease. Following the success of previous years competitions, for the third year in a row the Studio @ Palladium in conjunction with Kingsbridge Community College is running a competition for enthusiastic young designers to find the best technical and practical kitchen design. The year 9 Students were first set the task in November 2014 to design their kitchen, which included a mood board and a 3D model, with 1st, 2nd and 3rd prizes being awarded by the Studio Team. There will also be a prize for the design which gets the most public votes which is open to everyone including family and friends. All the designs are on display in the Showroom of The Studio in Higher Union Road, Kingsbridge or alternatively you can view them through our websites www.thestudioatpalladium.co.uk or www.palladiumbm.co.uk or via Facebook where you can "like" your favourite design. You can also email The Studio directly on studio@palladiumbm.co.uk. The design with the most votes wins. The standard this year is exceptional and year on year we've seen improvement in the design concept and commitment. The 3D models have to been seen to be believed, with the attention to detail on the desings we think this year will be the hardest to judge. 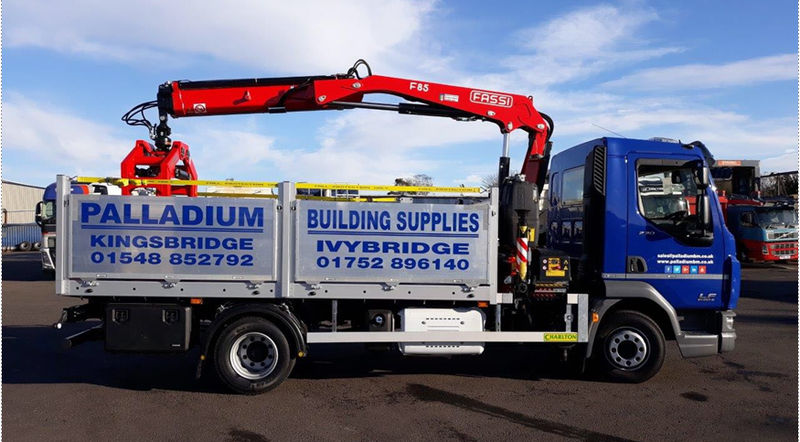 The latest addition to Kingsbridge delivery fleet, the Isuzu short wheel base tipper truck supplied by T Harvey & Sons of Cornwall. The Isuzu has a carrying capacity 1.25 tonnes and is purpose build for narrow lanes and hard to access sites. Local football team Railway Beacon U13 have been on a winning streak since being sponsored by Palladium Building Supplies, winning their last four games and already surpassing their results for the last two seasons. The team managed by Alex Yates and James Lucas play their home matches at Devonport Park and have become formidable opponents the season. They beat the top of the league team Callington at home on Saturday (21/03) by three goals to one and have won their last four matches, home and away. The south- West Racing Club is an independent organisation, formed in 1979 whose sole aim is to encourage interest in all aspects of horse racing, particularly in the South- West. The Club organise coach trips to many race days in Great Britain and Ireland, as well as value breaks abroad to meetings such as the Prix De L'Arc De Triomphe, Punchestown Festival or courses such as Chantilly, Baden- Baden and Cagnes Sur Mer. Social events are held from time to time as well as stable and stud visits. 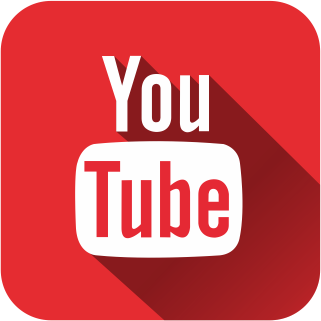 The Club is a non-profit making organisation and is run entirely by volnuteers. Membership is open to anyone interested in horse racing and members are drawn from all walks of life but share an interest in sport. To join simply send a cheque to the address below or get in touch via the contact details. WHY NOT JOIN US NOW! Roll the Dice has raced three times recently, finishing a very close 2nd at both Exeter and Ludlow. Last week he ran in the feature race at Ludlow, which was "His Royal Highness Prince of Wales Challenge Trophy", named afer Prince Charles, who won his only race under National Hunt rules at Ludlow. The ground was very wet and heavy, but even so he ran his usual good race to finish an excellent 3rd - he has been remarkably consistent, winning prize - money in 15 of his last 17 races. Roll the Dice is having a months' break and will race again towards the end of February. PS. All horses have their Birthday on 1st January and our favourite became 9 years old. Happy Birthday Roll The Dice! Our (almost) world famous Beanie Hat Competition is back for 2015, so for the most strking pose, unusual location or silliest face do what you have to do to make your picture stand out from the rest - best two will win the prizes, Good Luck!!! 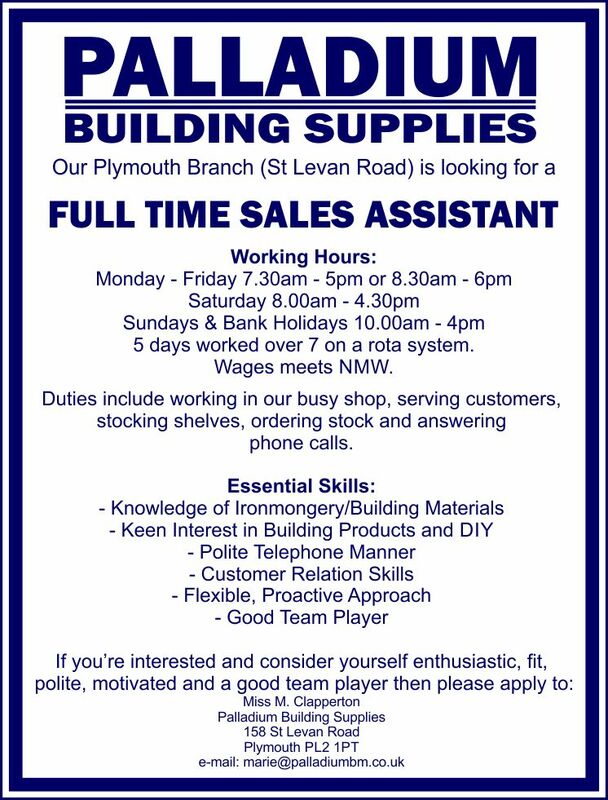 Our Plymouth Branch (St Levan Road) is looking for a Full Time General Sales Assistant. 5 days worked over 7 on a rota system. This season prize winner from our free draw, Mr Raspin. Congratulations Mr Raspin and enjoy! 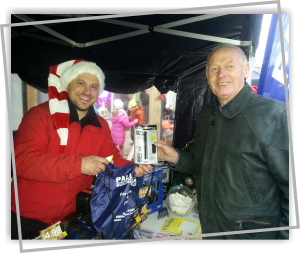 Congratulations to Mr Aves for winning our Christmas Draw in Plymouth! Kingsbridge Celebrates Christmas Draw Winner Chosen! 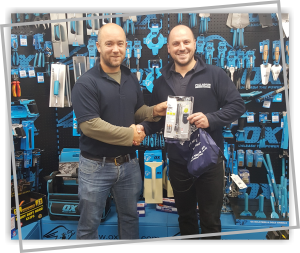 Nicky and Sylvain drew the winner for the Toolkit today and the lucky winner was Neil Steer - congratulations Neil, hope you can make good use of it!!! Thank you to everyone who attended the Kingsbridge Celebrates Christmas Fair at the weekend. The whole of Fore Street was blocked off at the bottom and the whole town came out to see and sample the local products on offer. The event was wonderfully staged, special thanks to Sylvain and Karina who manned to Palladium stall. On Friday 14th November 2014 an impressive £760 was raised in aid of Children in Need by the staff and customers of our Burrington Way and St Levan Road Branches in Plymouth. Staff came to work in their pyjamas or wearing their favourite oensies, selling cakes (including special Pudsey cakes), confectionary and there was also a raffle. Thank you to everyone who helped us make the day a success. 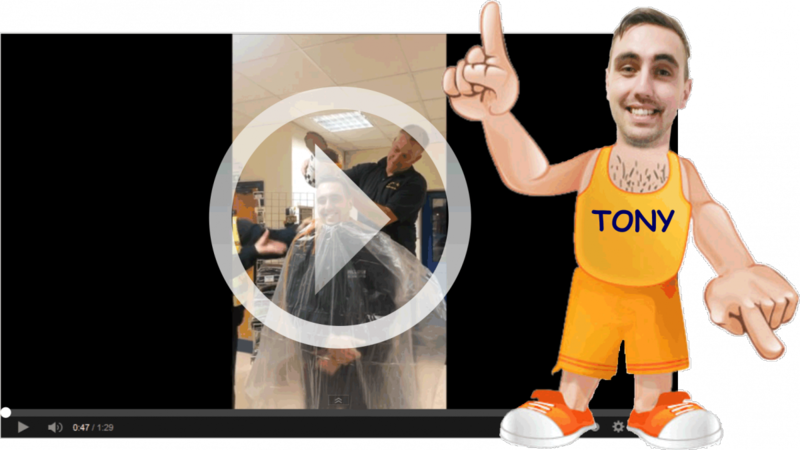 A special mention must go to Matt Clark who had his body waxed, Jessica Daly for donating her time and service and Tony Britton who had a large tin of baked beans poured over his head - sometimes charity hurts, just keep thinking worthwhile cause, worthwhile cause, worthwhile cause! Palladium Building Supplies sponsored horse Roll The Dice, returned fit and well after the summer break, raced recently at Exeter, finishing a very close 3rd narrowly beaten by 2 lengths. He also raced at Fontwell in Sussex again finishing 3rd , beaten only by a length. His next race is Exeter in late November, hopefully it'll be 3rd time lucky! Tuesday 11th November 2014 saw us launch our annual Kitchen Design Competition in conjunction with Kingsbridge Community College. This is the third year in a row we have run the competition, and yesterday we visited the college to present the competition to the year 9 students taking part. The aim of the competition is to get the students to present a brief/ mood board, plan and 3D model. Prizes will be award for 1st,2nd & 3rd place chosen by Palladium Judging Panel, there is also the opportunity for the public to get involved and vote for their favorite with a prize awarded to the winner of this vote. We are always impressed by the creativity of the designs the students create and are looking forward to seeing this year's efforts. Congratulations to Jan and Phil on their recent wedding - you finally made an honest man out of him Jan! On Friday 14th November our two branches in Plymouth will support Children in Need by coming to work in their pyjama's or by wearing an onsie. Raffle tickets are on sale now and the prize draw will be on Thursday 13th November, the 1st prize winner will get a 4 Ball round of Golf at St Mellion Golf Course on a day of choice (donated by DT Plastics), 2nd prize winner will get a 4 Ball round of Golf at Bigbury Golf Course (donated by Palladium), 3rd prize winner will get a ticket for 2 to attend Plymouth Argyle (donated by Palladium), 4th and 5th pize winner will get a Faithfull Drilling & Screwdriving Set of 52 (donated by Toolbank). Also on the day Tony Briton who works in admin at Burrington Way branch will have a caterers tin of baked beans poured over him and Matt Clark who is a general assistant at St Levan Road branch will have his legs waxed in aid of the charity. Join us for a day of fun and pain (for some)!!! Last Saturday 4th October saw 16 members of Kingsbridge Staff (and partners) enjoy a night out Tenpin Bowling in Plymouth. It was friendly two game competition with a bite to eat and a few drinks. 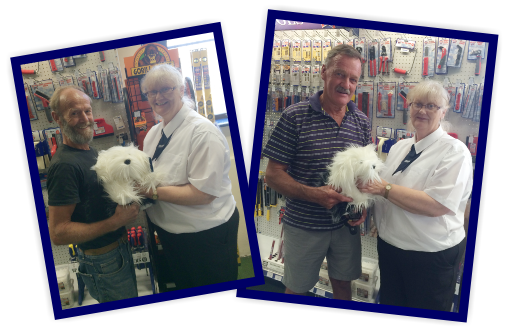 Our Plymouth branches recently ran a competition in aid of the "Children's Hospice Southwest" where customer's werre invited to name a toy Dulux dog and the branches managed to raise just over £100 for the chosen charity. The winning names were Bailey, Toby and Scruff, chosen by Mr. Clavert and Chris. A massive thank you to everyone who came, baked, bought and donated to our Macmillan Coffee Morning. Our Kingsbridge branch managed to raise a little over £156 and our Plymouth branch a little over £85 for a very worthy cause. Every cup of coffee sold and every piece of cake eaten helps give someone facing cancer the support they need to feel more in control of their life, from the moment they are diagnosed, through treatment and afterwards. PS. Special thanks to Caffe Amor for the donation of coffee and The Crabshell Inn for the loan of the coffee machine. Keith Olver Director of Palladium and Karina Tyszkiewicz Sales Ledger Administrator taking part in their Ice Bucket Challenge. Keith was nominated by Steward Pierce from Parker Building Supplies and completed his challenge today by having 2 ice cold buckets of water poured over him by Mike Jennings (Yard Supervisor). Keith has nominated the following 3 people: Gary Olver (Palladium Building Supplies), Simon Tandy (Kellaways) and Nick Edmunds (Wollens). Karina was nominated by Nick Cox (Palladium Kingsbridge Branch Manager) and she chose Nicky Wilson (Showroom Supervisor) and Sylvain Bordas (Shop Supervisor), who were happy to take a part in #IceBucketChallenge. Their nominations went to Lee Nightingale, Jo Clark and Allan Sander. We are choosing to donate to British Kidney Patient Association and donations can be made by texting BKPA11 to 70070 followed by the amount in £'s. Eg BKPA11 £5. 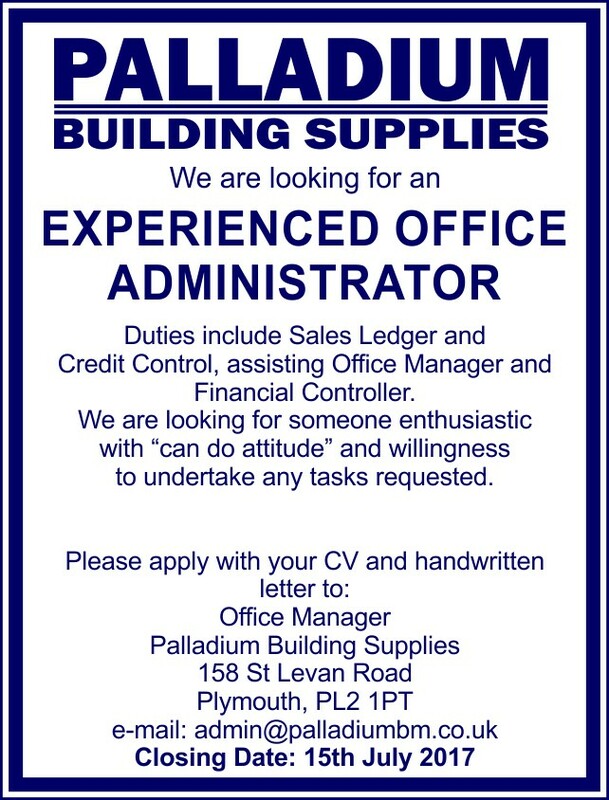 It's with great sadness Palladium Building Supplies is saying farewell to there long serving crane driver Lee Hassall. Lee has been with Palladium since April 2002 and will be missed by everyone. We wish Lee and his family all the very best for the future and will stay in touch. 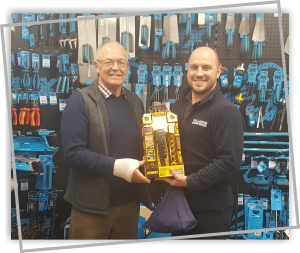 Congratulations to Luke and Gill, the winners of our Kingsbridge Show FREE Prize Draw, who won an amazing toolkit worth £150. 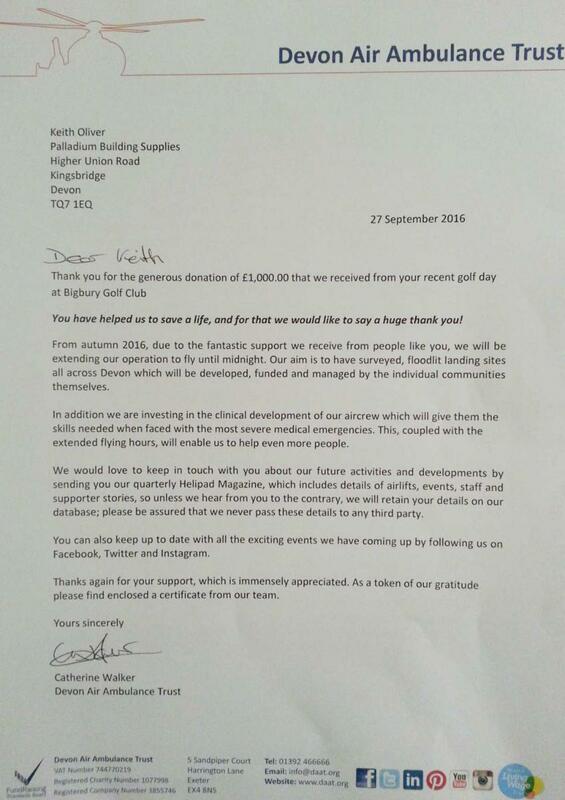 The Palladium Golf Day has raised £2500 for charity! 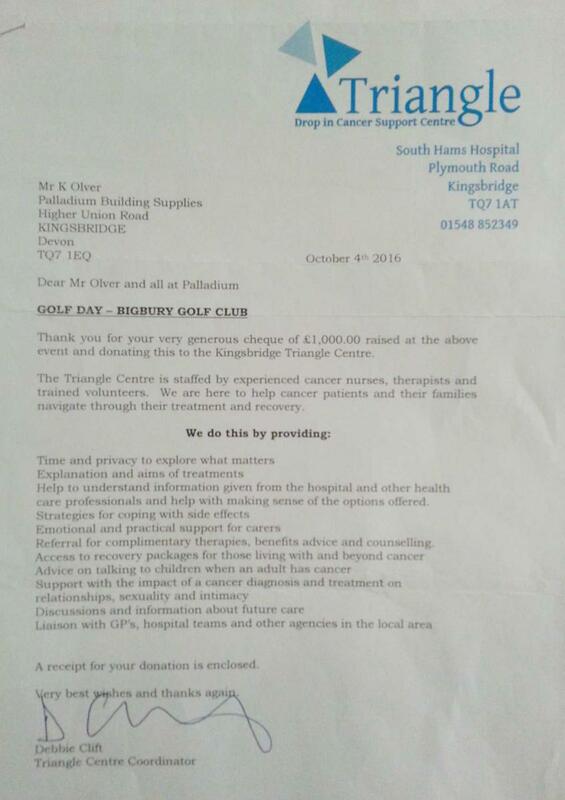 We managed to raise £2500 for charity at this years Golf Day in July, with money going to Devon Air Ambulance, Bigbury Golf Club Development Program and The Kingsbridge Triangle wich works closely with the Chemotherapy Outreach Project which enables patiensto be treated in local hospitals near to their homes. Due to extra funding and donations, in January 2011 this has meant that patiens who are eligible were able to receive their chemotherapy at one of three local hospitals, Kingsbride, Tavistock and Liskeard. (pic L-R - Paul Nesbitt (Roger Young), Pat Moore (The Triangle Centre, Kingsbridge), Karen Graddon (Bigbury Golf Club Ladies Captain), Harry Kerswell (Bigbury Golf Club Mens Captain), Keith Olver (Palladium Building Supplies) and Rex Brown (Devon Air Ambulance Trust)). Monday the 4th August 2014 saw six staff members give blood at Malborough Village Hall. We generally find that giving to charities can be a fulfilling experience, helping people less fortunate than us. Whilst as a business and company we organise charity events such as our annual golf day, we thought we'd actually make a personal promise to contribute to a worthwhile cause, so we chose to give blood, something we'll now do on a regular basis. With this in mind and after the success of the "No Make-Up Selfie" nominations in aid of Cancer Research, we thought we'd "nominate" other builders merchants, who could then contribute to a worthy cause. So, Inter-Line Building Supplies, Kellaway Building Supplies, Tamar Trading Ltd, Hughes Forrest and Palladium Building Supplies Plymouth. Please remember to keep us informed of what you do and importantly remember to pas it on!!! The annual Palladium Golf Day took place at Bigbury Golf Club on Thursday 24th July 2014. This year was slightly different due to the fact that the Plymouth branch were also involved making it a joint event. The day started with thunder and lightening so everyone feared the worst whilst enjoying bacon sandwiches and fresh coffee in a clubhouse but by 10:30am the sun was shining and by 11:00am the putting competitions was well underway. The golf proper was a shotgun start, with 19 allocated teams of 4, being ready to go at 1:00pm, luckily the rain held off for the day. After the prize giving, including a hole in one prize, the evening saw the almost world famous auction take place, with promises and pledges being made and item's being bought, with over £2500 being raised in aid of Devon Air Ambulance, Kingsbridge Triangle Centre and Bigbury Golf Club. In July, Palladium Building Supplies Branch Manager Nick Cox attended a graduation ceremony at Bristol Cathedral in recognition of his achievement in gaining a distinction in his foundation degree. Nick along with four other students undertook the final stage of his studies, the culmination of over 3 years work, by doing a paper on business sustainability, focusing on energy usage within Palladium Building Supplies and how improvements could be made within the organisation. The foundation degree was part of the Integrated Professional Development program at the University of the West of England, who worked closely with The Builders Merchant Federation to gain University accreditation for a unique development program for the builder merchant industry. Nick completed his 10,000 word document and submitted it under university rules and learned he gained a distinction in early June. Nick will further his studies within the builders merchant industry by working with the University of the West of England and The Builders Merchant Federation in trying to gain further academic accreditation. On the behalf of all the staff - WELL DONE NICK! We would like to welcome Allan Taylor to Palladium, Allan will be heading up our Plumbing and Heating, Kitchen and Bathroom departments which are based at our St Levans Road Keyhan Plymouth branch. 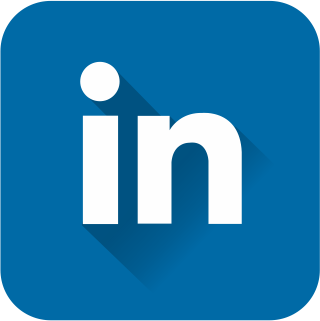 Allan has gained a wealth of knowledge within the Plumbing and Heating industry and has worked for national companies within the sector. 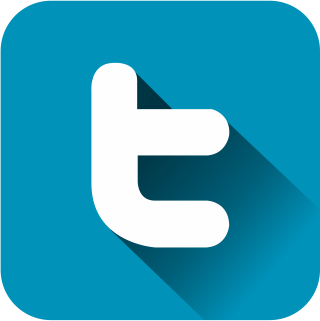 For all your enquires you can contact Allan on 01752 551881. On July 19th this year, our very own Karina Tyszkiewicz and Nicky Wilson will join thousands of other women and take part in the Midnight Walk in Plymouth, raising money to help St Luke's Hospice Plymouth provide free specialist end of life care to those who need it the most in their last months, days and weeks of life across Plymouth, South West Devon and East Cornwall. Karina and Nicky are hoping to raise £500 for this local, worthwhile cause by walking 7 miles over the evening and early morning of the 19th and 20th of July - they will be starting their walk at 11pm on the 19th and finishing around 2am on the morning of the 20th, so please give what you can because every pound will truly count towards the wonderful work St Luke's Hospice does. Thank You. To donate and support the "Palladium Princesses" please click picture below. We wish you a Happy Birthday Chris! We hope you enjoy your cake and presents! Fabulous opportunity to purchase a top quality products at bargain prices! 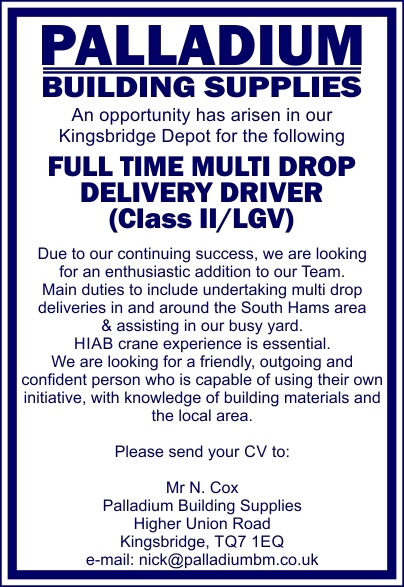 Contact our Kingsbridge Showroom for further details. Richmoor branded products are manufactured from New Life a high quality, sustainable alternative to traditional ingredients such as peat. They are made from 100% recycled green materials and organic forestry matter, boasting excellent quality it is clean, safe to use and consistently available in large quantities. It has unique natural water holding properties which ensure an ideal base from which to produce a wide range of high performance growing media products. The creation of New Life has helped to reuse over 100,000 tonnes per year of recyclable material which would have previously been lost to landfill. As a unique recycled alternative to peat, New Life represents the future for growing media products. Today saw staff and customers come out to support Liam (aged 6) and raise money towards a machine he can use daily to significantly slow down the progression of Duchenne Muscular Dystrophy, from which Liam suffers. We managed to raise £300 selling bacon rolls, coffee and delicious homemade cakes, thank you all so very much for supporting this worthwhile cause and helping Liam. Special thanks to , Adam Parnham and Caffe Amor for the donation of coffee, The Crabshell Inn for the loan of the coffee machine and Tesco and Morrisons for their donations. This year's Kitchen Design Competition came to a close in early April with a presentation at Kingsbridge Community College to the winners of both votes. The Studio @ Palladium along with Kingsbridge Community College ran a competition for students to design a modern functional kitchen, using the latest technology to ensure the best use of the space whilst using energy saving products. These designs were drawn and presented on mood boards along with a 3D design of their finished kitchen. We had the top three designs as voted for by the judging panel and a public vote where members of the public were invited to vote for their favourite deign. The top three as voted for by the judging panel were, 1st prize, Alix Myers, 2nd prize, Miranda Luckhurst and 3rd prize going to Holly Craig, with the public vote going to Olly Pound. There were prizes for everyone who entered with the winners receiving Amazon Vouchers. This is the second year the competition has been run and it was supported by Kingsbridge Community College along with The Studio @ Palladium, Palladium Building Supplies, VADO, Neff, PJH, International Decorative Surfaces and South West Laminates. Principle teacher Jill Flintham was very proud of the students’ achievements, the attitude and commitment by the students was excellent and many of the entrants could have a solid future in design and technology, congratulations to all those who entered, especially the winners. Congratulations to our Beanie Hats Competition winners! Well done to all those that entered this years Beanie Hat Competition - We'll see you next year!!! Helping to raise money for Liam Jones, aged 6, who suffers from Duchenne Muscular Dystrophy. All money raised will go towards a machine that he uses each day for treatment. Even though it cannot cure him it can significantly slow the progression of the disease down and reduce his discomfort and help improve his mobility. Sadly as this is classed as an alternative therapy there is no help towards cost provided by the government. Please, please, please come along and support it - Thank You! Oldroyd available from stock at our Kingsbridge Branch! 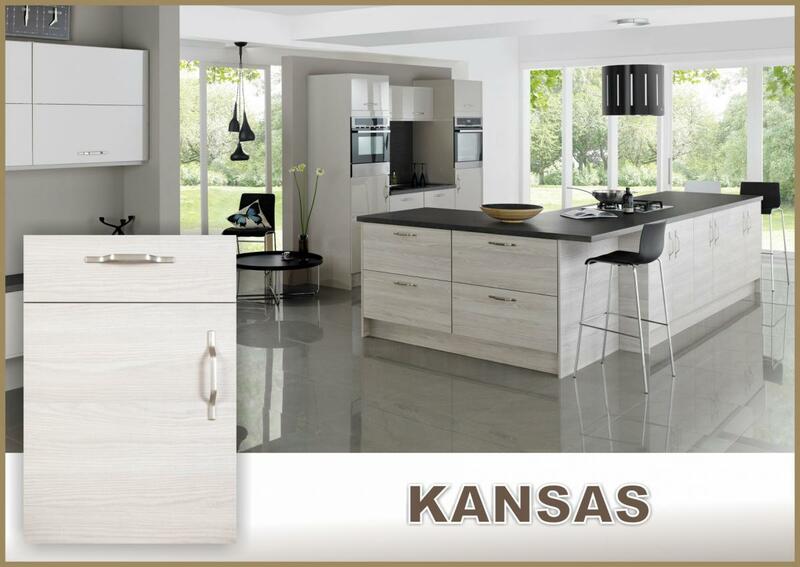 New Kitchen Ranges Available to order NOW! 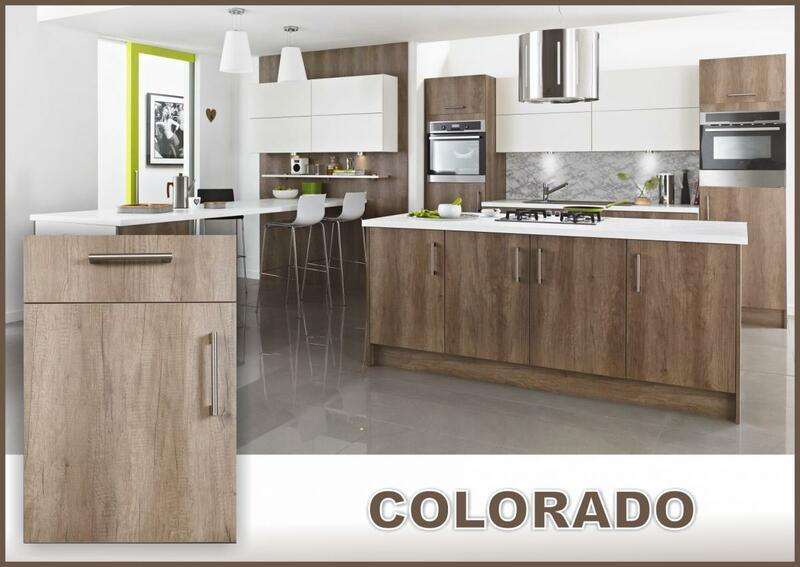 The strinking dark oak and vertical grain finish of Colorado is both stylish and on-trend. It gives a simple, yet stunning contemporary kitchen that is truly desirable. The cross- grain feature in this kitchen means it's right on-trend and a stunning kitchen that can be matched with our matt or gloss kitchen ranges. 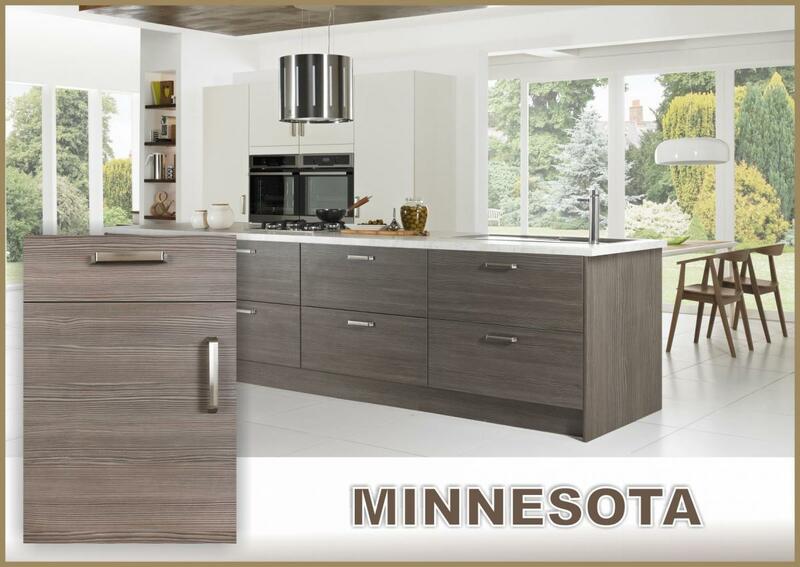 Minnesota's distinctive linear grain and sumptuous dark finish complements the kitchen perfectly. Following the success of last years competition, The Studio @ Palladium in conjunction with Kingsbridge Community College is running a Competition for budding designers to find the best technical and practical kitchen design. The Students Year 9 and 10 had 10 weeks to design their kitchen, which included a mood board and a 3D model. As you will see, the standard of application is excellent, whith 1st, 2nd and 3rd prizes being awarded for the designs chosen by The Studio Team. There will also be a prize for the design that gets most public votes. This is open to anyone - general public or the family and friends of the students. All the projects are being desplayed in the showroom of The Studio (Higher Union Road, Kingsbridge), where you can find voting forms. Alternatively you can vote via The Studio's Facebook page by "liking" the page and you favourite design. You can also e-mail The Studio directly on studio@palladiumbm.co.uk. It's simple, the design with the most votes - wins! Don't wait- choose your favourite design now! This season prize winner from our free prize draw, Alan Jones. Congratulation Alan and enjoy. So it's with sad eyes and a heavy heart we say goodbye to Janet Cook and Andy Way. Andy joined us serval years ago and moved onto pastures new, Janet has been with us for over ten years and has seen many changes for the business. Jan is retiring and relocating to the the Cotswold to be nearer family - Best Wishes to both! Saturday the 7th of December 2013 saw the annual Kingsbridge Celebrates Christmas fayre with local stalls the length and breadth of Fore Street, selling local produce and goods. Fore Street was closed for the day and everyone started early with stalls setting up from 8am and culminated in the Lantern Parade that left the top of town just after 4pm. 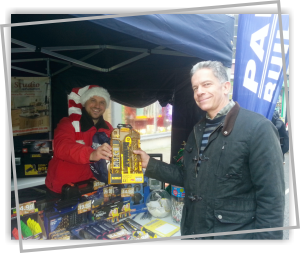 Karina, Sylvain and Barry were in attendance on the Palladium and The Studio stall and reported that everyone who visited the stall was in good spirits with Christmas cheer. The day was officially opened by Dr Sarah Wollaston MP. We also had Darth Vader and his Storm Troopers wondering around the town, along with Father Christmas who arrived by boat, Town Cries' and the Mayor of Kingsbridge, Irene Jeeninga. The day was a resounding success for the town, as well supported by local businesses and local residents, thank you to all who attended and supported the day. The Beanie Hat Competition is back this winter, the most striking pose, unusual location, make your picture stand of from the rest- top two will win the prizes - Good Luck!!! We are looking for a friendly, outgoing and confident person to assist in the designing and planning of kitchens and bathrooms. "Design and Plan" will include initial consultation with customer, on site visits and planning to the customer requirements, supply, arrangement of fitting if required and to provide aftersales service as well as administration duties. Experience in kitchen and bathroom design and CAD would be preferable but not essential as training will be given. A Special Mention to Elliot Hamilton who was voted West Devon Youth Player of the Season and Leon Horn who was voted Under-13s Best Bowler. Congratulations to all winners and runners up on a successful season. 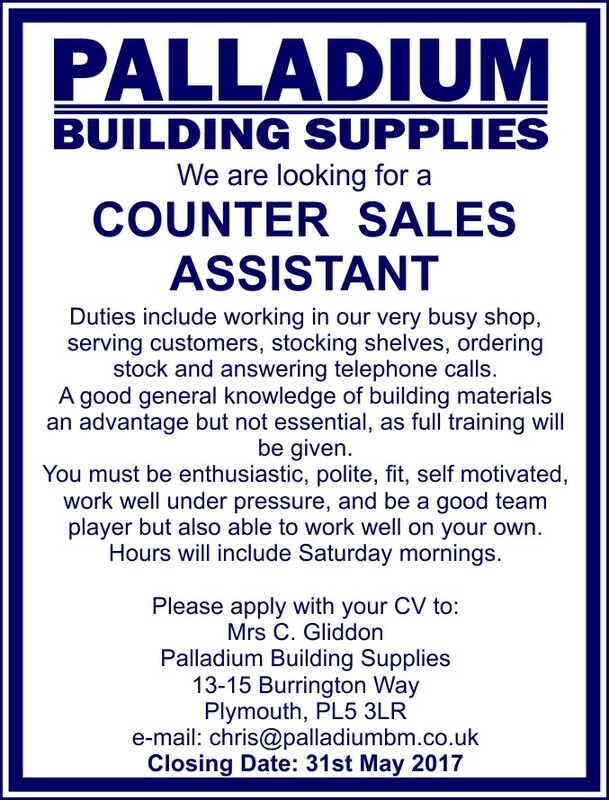 Our Kingsbridge Branch is looking for a Full Time Counter Assistant. 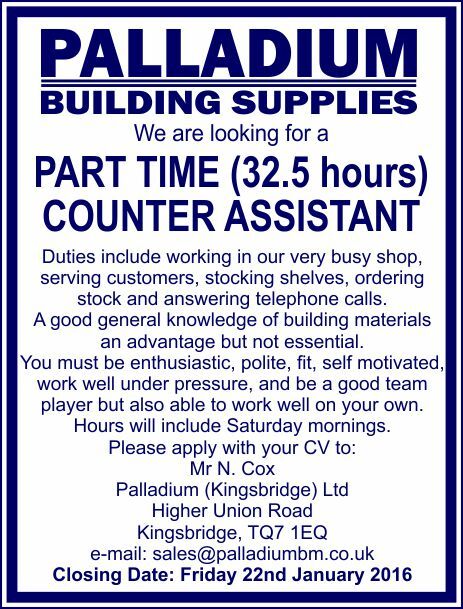 Duties include working in our very busy shop(s), serving customers, stocking shelves, ordering stock and answering telephone calls. A good general knowledge of building materials an advantage but not essential. You must be enthusiastic, polite, fit, self motivated, work well under pressure and be a good team player, but also able to work well on your own. 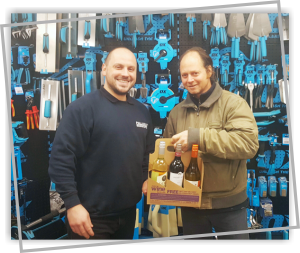 The prize winner from our free prize draw at this years Kingsbridge Show, congratulations Derek, hope you enjoy the wine. Last Saturday a group from Palladium spent the evening at the Maha-Bharat Indian Restaurant in Kingsbridge. We would like to thank for a lovely food and an excellent service! The Studio @ Palladium in conjunction with Kingsbridge Community College is running a competition to design a kitchen. As a consequence of last years competition being so successful it has been extended to this year with Years 9 and 10 being eligible to participate. Students were given a specific brief that includes a budget, a space that they must make the best use of and a range of relevant catalogues of featured products. They were asked to design a kitchen that's practicable, to scale, to budget with consideretion to the space they have to work with and the environment using energy efficient products. All students were given a project pack that has all the information they need to design their kitchen. Prizes will be awarded for the best three entrants. The competition runs for 6-8 weeks with the submitted designs being displayed in the showroom of Palladium Building Supplies and on-line . Nicky Wilson and Karina Tyszkiewicz of The Studio @ Palladium and Mrs Flintham of Kingsbridge Community College are responsible for preparing the students for the project. They will also make up part of the judging panel along with the Directors of The Studio @ Palladium to choose the eventual winners of the top 3 designs. The public will also choose their own winner via visiting our Showroom or voting on-line. Thanks to everyone who contributed and attended our Coffee Morning in ad of Macmillan last Friday. Our Kingsbridge Branch managed to raise a little over £91.72 and our Plymouth Branch £111 for a very worthy cause. Thank you all so very much. 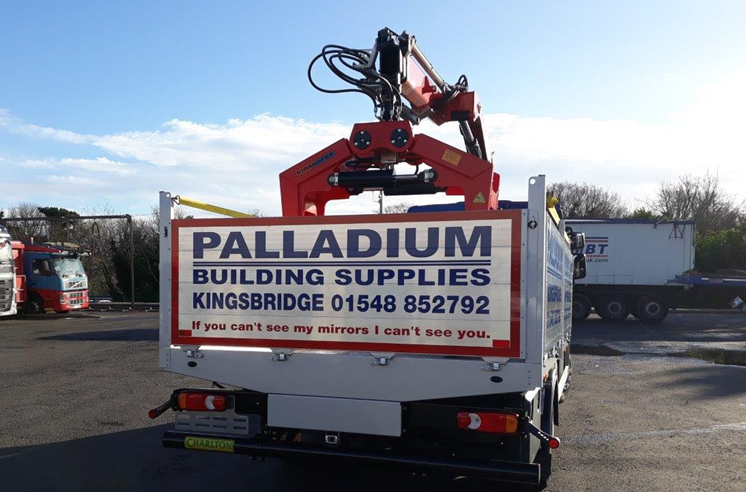 This year Palladium Building Supplies attend the annual Kingsbridge Show which saw a record turnout of over 10,000 people pass throught the gate on the day. It was an early start and a late finish for the Palladium team with glorious sunshine with the Palladium staff contributing to the fun atmosphere by giving out helium balloons nad tongue colour changing lollies, which seemed to be more popular with the adults than the children. The show which is in its 132nd year offers a local feel, keeping its traditional agricultural and horticultural roots with something for everyone, a little piece of rural England. Palladium Building Supplies was proud to attend the event and would like to thank all those who attended and visited our stands. Bon Voyage to 'The Bear'! So it's farewell and goodbye Mr Stevens, best wishes for the future, I'm sure you'll be successful in whatever you do. "Bon chance gros ours brun". Palladium managed to raise £3.300 for charity at this years Golf Day in July, with money going to Devon Air Ambulance, The Bigbury Golf Club Development Program and Cancer Research UK. Palladium Building Supplies in Kingsbridge got into the spirit of Kingsbridge Fair Week in July, dressing up as wizards and withces to hand our balloons and goodies to the public. Kingsbridge Fair Week can be traced back to the mid- 15th century when a Royal Charter was granted for the town to hold a trade fair and the fun element was added at a later date. Kingsbridge Fair Week is an annual event where towns people and visitors can take part in varous activities throughout the week, there's something for all ages and abilities. 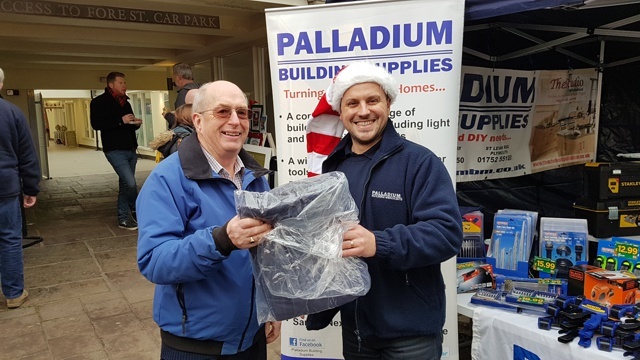 Palladium Building Supplies always supports this local and worthwhile event bringing fun and laughter (and usually rain) to the town, thankfully this year the weather was, for the majority of Fair Week settled and sunny. Come down to the the Fair Week Carnival in Kingsbridge tonight (27th July 2013) and meet our magical Trio!!! Thank you to all our customers: Richard Haver Construction Ltd, WM Construction South West Ltd, Simon Procter Building Contractors, M2P Design, Gibson Construction, Andrew Wood Building Limited, Norman Brooking Builders, D G Steere Builders, Seal Construction, Hayman Construction, Michael Heath Building Contractors, and suppliers: Carlise Brass, Yennadon Stone Ltd, Austen Knapman who suported our feature in todays Kingsbridge Gazette! Our annual Golf Day managed to raise £3,300 for charity. The money raised will be split between The Devon Air Ambulance, Breast Cancer Research and The Bigbury Golf Club Development Program. The day included a golf trick short artist who wowed the crowd with his skill and timing, also a bonus was a lovely weather which managed to hold for the whole day. Thank you to the Kingsbridge in Bloom comittee for inviting us to their presentation last Friday. The commitment and dedication of the people that give their time and energy for the good of the town is an inspiration to us all. The judges from South West in Bloom were very impressed with the standard and if the Kingsbridge in Bloom do well then they will go forward to the National competition. 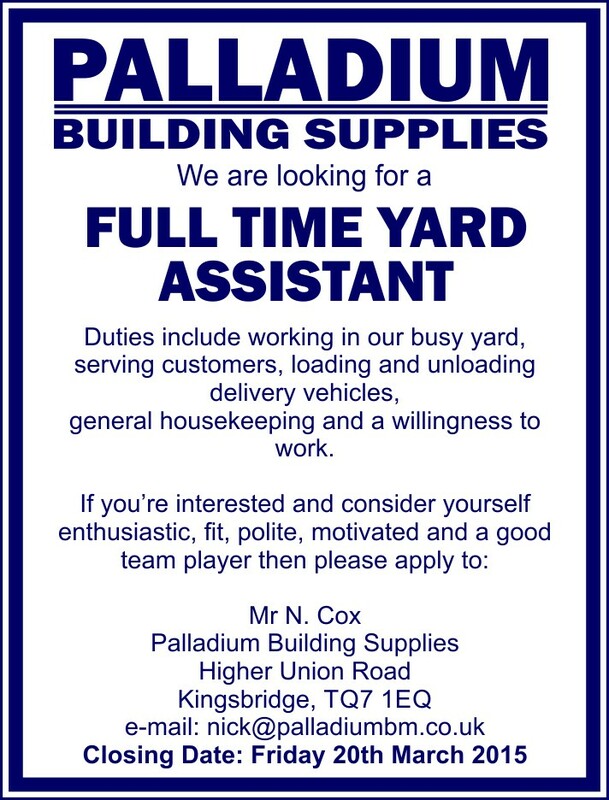 Palladium Building Supplies are very proud to be associated with Kingsbridge in Bloom. Pictured: Karina Tyszkiewicz (Palladium), David Dain (Kingsbridge in Bloom), Nick Cox (Palladium). Friday was a sad day for the Kingsbridge Branch as Steve after nearly 12 years has moved onto new pastures. Everyone at Palladium will miss Steve greatly and his tasty cakes made by his lovely wife. We wish you all the best for the future Steve! The South West in Bloom competition comes to Kingsbridge this week. Representatives from Kingsbridge in Bloom will accompany judges from South West in Bloom to the several sites around Kingsbridge. Judging starts this Friday the 12th July at 9:30am so let's all get behind this and show our town at its very best. Good Luck to the Kingsbridge in Bloom Team, the town looks fantastic, you should be very proud!!! So it's goodbye and farewell. We've had out tears and laughter over the years, bon chance my son, it's been emotional!!! Palladium proudly sponsored The Green Ark Children's Centre in Plymouth. We hope that the children will have lots of fun playing with the water! Our very own Mike Jennings along with Plymouth Branch's Sam Carr and Dan Tomes attended product training at Hunter's new premises in Maidstone, Kent. 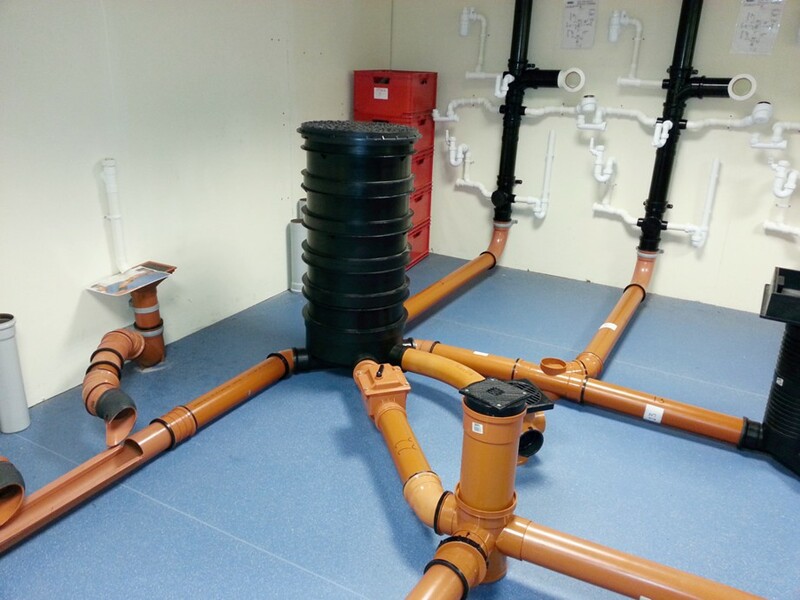 The trio were tasked with building a stack pipe from scratch with just a drawing and a box of plumbing items. 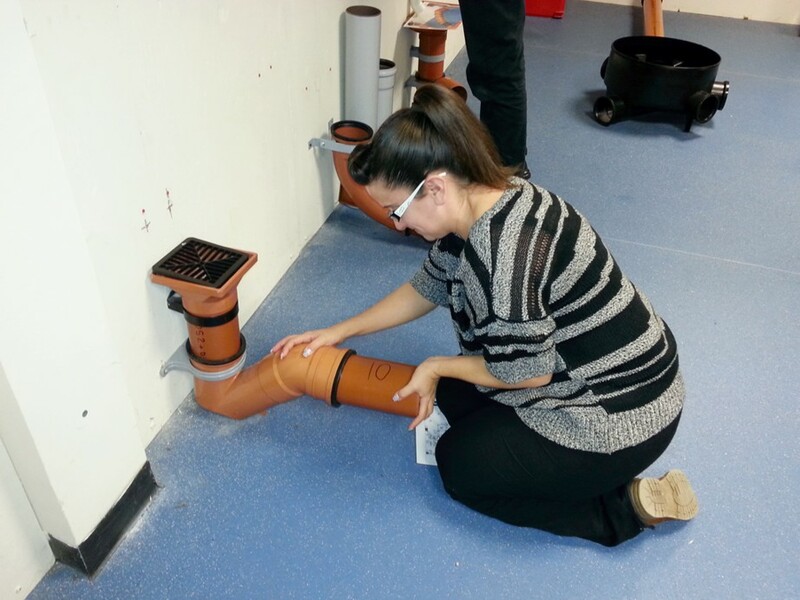 They were then asked to build an underground system, again from a drawing, using a box of plumbing items. 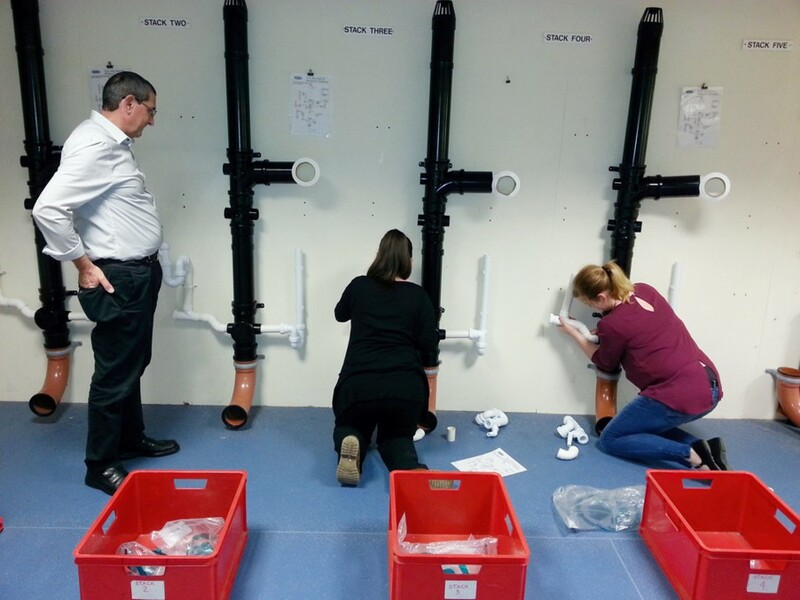 All agreed the training was extremely beneficial and has given them ideas on how to further their respective Plumbing Departments and has given him them the confidence to progress and move forward in the understanding of what's required to advise customers on the bes plumbing solutions for them. Last week we visited the Kitchen, Bathroom and Bedroom Show at the ExCel Exhibition Centre in London. The show impressed with the latest trends, innovations and fashions in kitchen, bathroom and bedroom design and the latest technology available to make designs truly unique. We then visited Syphony Group at their marekign suite in Barnsley and their warehouse facility in Rotherham at the invitation of Mike Lockman. Visiting Symphony is always inspiring, their commitment to kitchen design and innovation is exceptional, thanks to Mike and all the Symphony for their hospitality! "Down with energy costs" Roadshow coming to Palladium in Kingsbridge on the 28th May 8am - 12pm. Drop in for no nonsense, impartial, free advice from the South West Energy Centre experts on how to reduce the energy costs in your business. SWEC can monitor energy usage and give detailed recommendations for reducing energy costs by adopting energy efficiency measures and / or renewable technologies. Palladium Building Supplies sponsor a racehorse called Roll The Dice. It is trained by leading trainer Philip Hobbs who is based at Minehead, and normally ridden by top jockeys Richard Johnson (pictured) and Tom O'Brien and has been successful in this seasons National Hunt winning at Ludlow and Wincanton. Roll the Dice has also placed 2nd and 3rd five times. Roll the Dice will now have a break for the summer and return to race again in the autumn. Congratulations to our Beanie Hat Competition Winners! Congratulations to Jonathan and Richard, our Beanie Hat Competition Winners! The West Devon Palladium Youth Cricket League - The league has started its 29th season! We wish you all the best for the future Lou! Visit our newly refurbished Bathroom & Kitchen Showroom at St Levan Road in Plymouth. A range of bathroom products from Eastbrook, Woodstock, Merlyn and Claygate can be viewed, from standalone vanity units and shower cubicles ranging from 6mm right up to 10mm tempered glass to complete bathroom suites and solutions of the less able. Our Gallery by Symphony displays give just a taster of the contemporary and traditional styles of kitchen furniture available, with complimentary worktop displays from Getalit and Duropal. Our friendly will be happy to assist you with your bathroom and kitchen requirements. No obligation design design and quotation service available. We would like to thank Cafè Asia for a wonderful meal and an excellent service last Saturday night. Everyone had an enjoyable evening! Congratulation to Sylvain and Karina who received their certificates after completing an Emergency First Aid at Work Course. The Worshipful Company of Builders’ Merchants made award to four BMF students at its annual City & Awards Luncheon. The event on March 5 took place at the historic Ironmongers’ Hall in London saw awards being presented to the top four graduates of the Builders’ Merchant Federation Diploma in Merchanting. 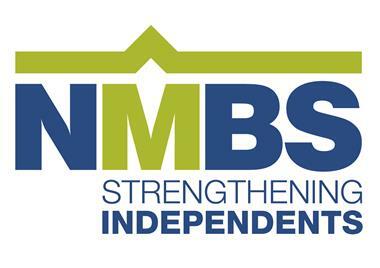 The Worshipful Company of Builders’ Merchants supports training and educatin in the merchant industry through its close links with the IoBM and BMF. The City & Awards luncheon hosted by the Company is an opportunity to recognise the achievements of young merchants in the industry. Glenn Paddison, MKM Building Supplies Ltd, won the Company’s first prize and the Golton Medal 2013. Roy Shewry, Hoppings Softwood Products PLC, won second and Nick Cox, of PALLADIUM Ltd received third prize. The fourth prize went to Ryan Osborne, Hopings Softwood Products Ltd. Thank you to everyone who completed the Kitchen Design Competition-prize giving was held on the 14th of March at Kingsbridge Community College. All the work was to an exceptionally high standard and the potential in the designs was clear to see. The application and commitment by the students was truly amazing, well done to you all, you should be very proud. We also would like to thank Jill Flintham for her enthusiasm and commitment as well as all the sponsors: Palladium Building Supplies in partnership with VADO, The PJH Group, Neff, IDS International Decorative Surfaces and LWS Laminate and Worktops Southwest Ltd.
Our Palladium Beanie Hat Competition is gathering pace with a spread of pictures available to view on our Website and Facebook Page. We'll draw the prize for the best picture towards the end of April 2013 so keep sending them in! VADO is a leading British bathroom brassware manufacturer providing high quality taps, showers, accessories and fittings. Every product VADO offers is created and produced around their four core values: quality, design, service and innovation. Their four core values can be seen first hand on our VADO display at our Kingsbridge showroom. We have a selection of their product ranges for you to see, touch and feel so visit us in Branch and view the latest design innovations from one of the country's leading manufactures in bathroom taps, showers and accessories. 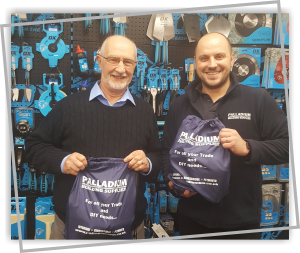 Congratulations to both Jason and Brian from Palladium Building Supplies in Kingsbridge who attended a First Aid at Work Requalification and passed! The Studio @ Palladium is running a competition in conjunction with Kingsbridge Community College for Year 10 students to design kitchen. A specific brief was given, the kitchen had to be practical, designed for a modern living family and the students were given a lesson in kitchen design. The students had 10 weeks to design their kitchen, which included a mood board, with a perspective view and a 3D model with prizes for the top three designs chosen by The Studio team. There is also a prize for the design that gets the most public votes. All the students projects are being displayed in the showroom of The Studio where you can find voting forms. Alternatively you can vote via The Studio's Facebook page (/The Studio At Palladium) by "liking" your favourite design or you can e-mail The Studio directly on studio@palladiumbm.co.uk. Voting is open to everyone and the closing date for votes is 8th March 2013 so vote now and choose your winner. Click here to view all entries for the Kitchen Design Competition. After all their hard work and effort, our sales office finally have somewhere to show their samples! Our Xmas Draw lucky winner collecting his prize from our Branch Manager Nick. Congratulations Andy! Louise Green our glamorous accounts office assistant drawing the winning ticket for our Christmas Prize Draw, a case of wine for the lucky winner who'll be contacted shortly. The organization behind this is Link International which is a charity that gives young people from the UK a chance to experience life and work in Uganda. The village is called Mityana in Uganda and it's one of the poorest areas of the country. An area was cleared, goal posts were put up and the kit was given out to the children. They have never had a proper football kit before and the obvious sense of togetherness was you could imagine, overwhelming. As the company that supplied the football kit, it was pleasing to see the joy on the children's faces, something so simple made, even just for an afternoon, the children smile and it gave great pleasure to the staff and directors of Palladium Builders Merchants to see the children playing and enjoying themselves. The "Movember" saw Sean Dunne, Laurence Parkinson and Jason Hawkes from Palladium Building Supplies, Kingsbridge, Devon raise over £500 for causes related to mens health. The group calling themselves The Kingsbridge Gentlemen managed to raise the profile of this important issue by asking customers, suppliers and colleagues to sponsor their campaign. "I may even keep my moustache" said Laurence," I've not grown one since the 1970s and my wife commented that it made me look younger" He's the one in the middle, judge for yourself! The Studio @ Palladium is running a competition for budding designers in conjunction with Kingsbridge Community College for students to design a kitchen to scale. Nicky Wilson & Karina Tyszkiewicz from The Studio attended a lesson, met the students, gave a presentation and competition packs to the students explaining that there will be 1st, 2nd and 3rd prizes for the best technical and practical designs chosen by The Studio Team. There will also be a prize for the design that gets the most public votes, with the students family and friends being invited to vote either on-line or at The Studio for the design of their choice. 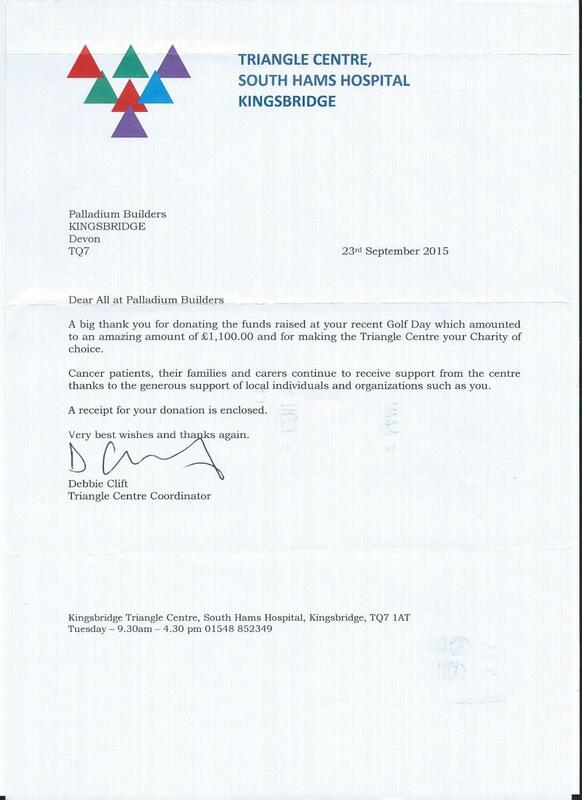 The Palladium Golf Day has raised £1760 for charity! Our annual Golf Day at Bigbury Golf Club managed to raise over £1700 for St. Luke's Hospice in Plymouth and the Golf Club Development Fund. The event saw forty eight customers and suppliers play the eighteen holes in support of the charities. The annual golf day has been held for the last 16 years, with Palladium Building Supplies and Bigbury Golf Club working together to ensure the on-going success of the event. A big Thank You to all those who attended and for helping to raise the money for two very worthwhile causes. Our very own Karina and Barry spreading magic and joy over the Kingsbridge Fair Week Carnival. The good witch Karina cast a spell so the weather was nice and Barry the jolly wizard cast a spell so everyone attending the carnival had a fun time. To all those lucky boys and girls who met Karina and Barry, remember to keep your magic balloon safe. Our very own Jason Hawkes who passed his NVQ Level 2 in Warehousing and Storage - Congratulations Jason, very well done! Our very own Nicola Wilson & Sylvain Bordas proudly displaying their NVQ Level 3 in Management Certificates. Congratulations to you both. As a part of the Queen's Diamond Jubilee celebrations Sylvain Bordas was invited to attend a luncheon with Her Majesty Queen Elizabeth II. Sylvain who is the shop manager in Kingsbridge branch was invited by the Worthshipful Company of Builders Merchants to Westminster Hall in London because of the standard he attained in the training he received. Sylvain undertook training through athe Builders Merchants Federation, obtaining five distinctions which made him be leading nationwide trainee, going to a presentation to Birmingham to receive his price. Sylvain was thrilled to be able to attend the luncheon, being seated a few tables from Her Majesty. Sylvain sad "It was a day he would never forget, an incredible experience and an honour to be a part of a Diamond Jubilee Celebrations".